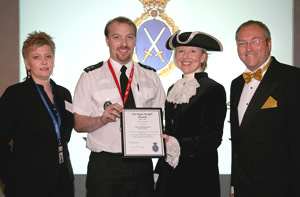 '2 Smart' is the Essex Police Award winning project that in 2008 expanded to cover Alcohol, Drugs, Bullying and Knives. The project was previously known as '2 Smart 4 Drugs' but now in recognition of growing crime trends and keeping pace with young peoples education needs, the project has been expanded to encompass the foregoing key issues. '2 Smart' is the Essex Police Award winning project that in 2008 expanded it's programme to cover Alcohol, Drugs, Bullying and Knives. The project was previously known as '2 Smart 4 Drugs' but in recognition of growing crime trends and keeping pace with young peoples education needs, the project now encompasses the foregoing key issues. '2 Smart' is rolled out across the entire County of Essex including Southend and Thurrock unitary areas. In excess of 80% equating to 15,000 year 7 Schools Pupils aged 11-12 years old attended the Roadshows, forming part of their Personal, Social and Health Education Programme at School in the curriculum. Every School, Pupil Referral Unit, Excluded and Special Needs Pupils are invited, including young people working with Youth Offending Teams and some Home Educators. Each year the '2 Smart Roadshow' is honed and improved to provide the best recipe of 90 minutes of lively, engaging and interactive education which in 2009 reached in excess of 17,000 Year 7's. It combines an interesting mix of music, dance, comedy, theatre and role model depiction to educate 11-12 year olds around the County of Essex. The key use of theatre in education, role models and positive peer work engages young minds. The 2011 '2 Smart' programme is a lead Essex Police project now in it's 15th year...current Roadshow dates are shown below and on the 'Events' page. This exciting Roadshow can be picked up and taken anywhere in the United Kingdom. In this respect welcome enquiries from other interested Police Forces and/or agencies to info@KnifeCrimes.Org or contact '2 Smart' direct through website. 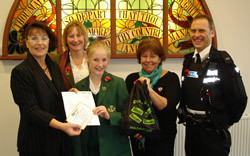 The winner of the 2008 2smart competition being presented with her certificate at a local school in Southend, full story coming soon...13 year old Philippa Smith a year 8 pupil at Southend High for Girls penned a light-hearted story to accompany pictures that Westley drew when he was a Year 7 pupil. PC Gary Collard, Schools Liaison Officer said..."Pupils were really moved by Westley's story during the 2 Smart Roadshows and it really helped to illustrate to them the dangers of carrying Knives. We hope they went away remembering his story and the devastating effect it had on Westley's family and it has convinced them never to go out carrying a Knife." 2Smart...This year Essex Police has created a new initiative to engage young people into taking notice of important safety and anti-social behaviour messages. Now Essex Police has helped launch a text campaign from Crimestoppers called... "KNOW SOMEONE WITH A KNIFE!" ...If you know someone who is putting their life at risk or someone else's life at risk by 'carrying a blade' then text to this number 88551 - this is anonymous and most important, could save a life! Young people from Braintree, Witham, Maldon, Gosfield and Dunmow Schools were the first to see 2SMART 2009 when the Roadshow visited Braintree on Friday, 20th March, 2009. 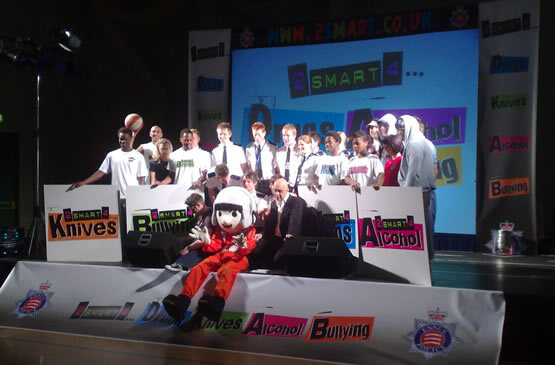 2SMART...the Essex Police project gave young people advice about Knives, Bullying, Alcohol & Drugs via Music, Dance, Sport and Drama. Fun and learning go hand in hand at 2SMART ROADSHOWS. Performers during 2009 included new 2SMART Dancers from the Karizma Dance Company and music from Taner, a 27 year old unsigned R & B Hip-Hop artist from Essex. Streetball Extreme illustrated their basketball skills...The Bald MC Nav Oojageer from Essex and the London Bus Theatre Company based in South Essex formed part of the fun programmed...hosted by 'Dom' from Essex FM. 2SMART was among 50 community projects, charities and individuals to receive grants at a special ceremony held at the Fennes Estate in Bocking on Wednesday 4th March, 2009. Jo Murphy from the Essex Community Foundation which organised the Event said..."Essex Community Foundation and the High Sheriff's Fund are very pleased to support the 2SMART Roadshow. It is an excellent partnership project which reaches so many children and young people, helping them to understand the dangers of issues such as Knives, Bullying, Alcohol and Drugs.